1. Battle MK. I part: 12 Sqn, RAF No. : V (P6597) Binbruk, United Kingdom, July, 1940. 2. 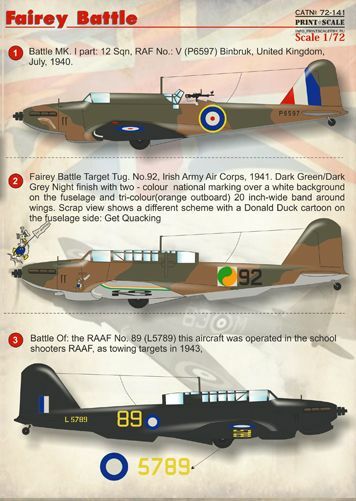 Fairey Battle Target Tug. No.92, Irish Army Air Corps, 1941. Dark Green/Dark Grey Night finish with two - colour national marking over a white background on the fuselage and tri-colour(orange outboard) 20 inch-wide band around wings. Scrap view shows a different scheme with a Donald Duck cartoon on the fuselage side: Get Quacking. 3. Battle Of: the RAAF No. 89 (L5789) this aircraft was operated in the school shooters RAAF, as towing targets in 1943. 4. Turkey Fairey Battle Mklll, 2829/29, Turkish Air Force. Dark Green/Dark Earth/ Night finish; red rudder with white crescent and star superimposed. Red/white wing markings; serial 2929 in white under wings, and 29 in black on fuselage sides. 5. Fairey Batle Mk l K9299/GV, No.103 Squadron (RAF), Benson, early 1939. Dark Green/ Dark Earth/ Night finish with white codes; black serial on fuselage and rudder, white under wings reading from leading edge under port and from trailing edge under starboard A type roundels on fuselage and above wings; note unit badge on fin.